​Portable manual and electronic typewriters can be a decorative and highly practical solution for distraction-free writing. While you can scour eBay and find antique typewriters that are authentically rusted, many savvy consumers are purchasing modern, manual and electric portable typewriters. They are well-constructed, easy to travel with, without sacrificing the authentic feel and touch of a 'real' typewriter. One buyer we spoke with purchased this lightweight typewriter because his work requires him to to fill out many paper forms. A millenial, he had never used a typewriter before but found the Brother Correctronic easy to learn. It's a small and lightweight option, occupying an unobtrusive amount of space in his home office. Even though it's small, the keys have a nice spring to them and the construction of is by no means cheap. The keys provide a satisfying clicking noise, though it might be too loud for some, especially if you live with a husband or wife who hates the sound. It includes a white-out function to help correct typos, easily erasing errors, and an integrated line-guide helps ensure that your typing remains on point. Other users find it a convenient way to type on checks, envelopes, insurance forms, etc. An efficient way to accomplish small typing jobs. There are several best-selling portable typewriters on the market- lets take a look at them and see how they compare. Many people that have purchased portable typewriters noted that the typewriting on manual machines can be very loud. They also note that portable typewriters generally do not take cartridges- instead they require ribbons on spools. Another complaint at frequently arises regarding portable manual typewriters is that they are frequently damaged during shipping requiring some users to return them for replacement typewriters. One of the primary benefits of using a manual typewriter is the distraction-free writing environment it creates. Instead of working on a desktop or laptop computer and checking Facebook every 15 minutes and going down that distracting rabbit hole, using a manual typewriter, sitting at your dining table or office space, you can truly get some genuine work done. Another reviewer writes that for those who are older generation they would be comfortable with the idiosyncrasies of using a manual typewriter as opposed to a slick Asus laptop. So, there is a bit of a learning curve when it comes to using these old-fashioned typing devices. While it's possible to buy some of the antique versions of these typewriters on eBay it will often be the case that you will have to fix them up and repair them, which can be very expensive. Better to purchase a newly manufactured portable manual typewriter and get the warranty included. Users were also surprised at how heavy these portable typewriters were- especially when carried in the carrying case. Another surprising distinction between these manual typewriters and a computer keyboard is that it takes much more effort to hit a key and can result on the page. While there are portable manual typewriters there are also portable electronic typewriters that typically feature automatic correction systems, character memories, automatic bolding and underlining as well as highly sensitive touch keyboards. Another interesting use case for both electronic and manual portable typewriters is that many governmental agencies still use paper forms that these typewriters help to fill out. One professional writer with over 50 short stories under his belt was particularly happy see the Daisy Wheel portable electric typewriter available for a relatively low price. He writes that he is able to use one high-year-old typing ribbon and get 80,000 characters out of it. He also suggests that a electronic portable typewriter is a cheaper alternative to a traditional computer desktop or laptop with a printer. Many users were highly satisfied to find that free shipping was available for the manual and electronic portable typewriters they were interested in purchasing- this is not to be understated as many of these typewriters weigh more than 10 pounds. Yet another user rights of using the electronic typewriter for creating shipping labels as well as writing a novel. Another con that users note is that ribbon cartridges can become expensive if you need to replace them. As well, correction tapes are often difficult to replace. 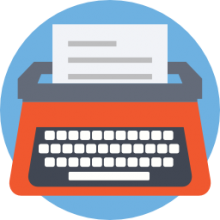 A typewriter is a piece of mechanical or electronic typing equipment that will print letters onto paper once a user presses a key. While they may seem outdated now with the advent of computers, laptops and iPads, typewriters were in fact revolutionary devices when they were first conceived. Though many people wish to consign manual and electronic portable typewriters to the dustbin of history, users keep coming back to them because of how satisfying they are to use as well as the distraction-free writing experience that many professional authors prioritize. A typewriter contains and is constructed of several main components that include the keyboard, pink ribbon, but typing letters as well as the platen. The platen Is the portion of the typewriter grips the paper that you typed on to. These are usually rollers that will help to advance the typing paper with each line so that the user can keep their attention on their typing. Interestingly, the modern keyboard layout was influenced by typewriter manufacturers you wish to slow the pace of typing because the typewriters could not keep up. They're actually more efficient keyboard layouts available but we are still using the old-fashioned typewriter-influenced layout from decades and decades ago. Perhaps the primary disadvantage of using a typewriter is that once you make an error is very difficult to correct. You may need to use white out, however there are some modern typewriters that are able to actually erase ink. That said, many users are still infatuated with typewriters, perhaps because of the satisfying clacking sound may make or their association with authors throughout history have created the great works of literature using typewriters. If you are looking to purchase a portable automatic or electric typewriter, make sure you read many reviews and ensuring that you have vetted the warranty information on the product page so that you'll be able to return your portable manual or electric typewriter if you're dissatisfied with it.